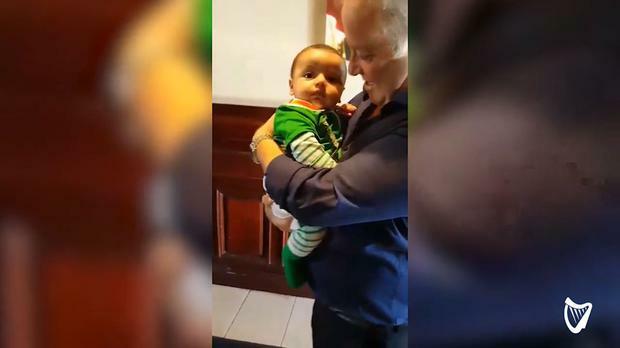 This is the gorgeous and emotional moment an Irish granddad meets his Autralian-born grandson for the first time. Elaine Dunwoody moved to Adelaide, South Australia from Dublin four years ago. On June 16 of this year, she gave birth to her son Nathan Paul. She was desperate to bring her son home to meet his Irish family as soon as possible but, she explained to Independent.ie, she had "trouble getting the little man's passport". With the passport delay, Elaine was worried that she wouldn't get to see her family before she was due to return to work in January. Fortunately, everything was sorted in time and the family flew home on Wednesday to surprise her dad Paul, while he was at work in The Elphin Bar in Baldoyle. "Finally the passport came through," Elaine explained. "I received the passport on the Tuesday and was on a flight on the Wednesday... my Dad had no idea as you can see." They new little family rocked up to the bar as soon as they landed on Thursday to introduce granddad Paul to his grandson. "My poor Dad, I actually don't ever remember seeing him cry ever," said Elaine. "He's absolutely delighted."